February 18, 2012, 12:54 PM · I've found something that's possibly more addictive than coffee or even Facebook: Ancestry.com. Yes, I've been digging around in the family history. By the way, I've found I'm unofficially a Daughter of the American Revolution on my mother's side. But that's not the line that interests me. I want the scoop on my German great-grandparents on my father's side, Marie Ungar and Albert A. Geiger, whose parents came to America from Germany on a boat in the late 19th century. Marie and Albert married, had my grandmother and her brother, then both promptly died, leaving their children orphans. My grandmother was three. Their uncle's family took them in; but though they adopted the brother, they did not give my grandmother their name, because she was a girl. Gertrude would marry and take another name, so what did it matter? She remained a "Geiger" until she met my Irish grandfather and became a "Noonan," but the whole naming business remained a source of bitterness. They took care of her, though, and they did give her something from her father: the violin that his family, the Geigers, had brought over on the boat. Very little did I know of all this, when I was a little girl. I found that violin in the attic in my grandparents' Rocky River, Ohio, home. Everything in the attic smelled of mothballs, and in the summer, it was a good 20 degrees hotter in there than in the rest of the house. I wasn't really looking for a violin that day; I was looking for dress-up clothes. I looked at the violin with interest, then forgot about it when I spotted a promising-looking trunk, which turned up some shiny red and purple leotards. I started playing the violin later, when I was nearly nine, exactly on this date, Feb. 18, 35 years ago. I lived in Aurora, Colorado, far from my grandmother. A girl named Sarah had come to play for my fourth-grade class -- she was helping the recruiting efforts of our school music teacher, Linda Walker, who was hoping to build a stronger strings program. I saw the violin, heard it, and knew immediately that I could do it, that I had to do it. As a matter of fact, I was dying to do it. My mother said no, I was going to learn to play the piano. "But Mom, we don't have a piano!" "Good point," she said. "Okay." Eventually I grew to need a full-sized violin, and we bought a very awful one at a local music store, an off-year Roth. I didn't quite know how bad it was, I was too busy playing it. Soon thereafter, my Ohio grandparents made a great pilgrimage to visit us in Colorado. They actually drove across the country (and the speed limit was 55 mph!). With more ceremony than I could understand, they gave me that violin from Germany -- my grandmother's violin, from her parents. They'd had it restored it at a shop in Cleveland -- in Cleveland they know what to do with a fiddle. The violin sounded nice, so much nicer than what I'd had! It was not a fancy fiddle, and it had no pedigree; it was a German factory fiddle. But it responded to me easily, and well. I used it for many years, all the way through college. And I still didn't know the story! I knew vaguely that the fiddle had come over from Germany on the boat, with my great-grandparents - the Geigers. "Really, 'Geiger'?" a friend said, years later, when I was in graduate school at Indiana. "Yeah," I said. "Maybe the Germans gave me my musical talent, because no one in my family is a musician." "Are you sure?" my friend asked. "You know the word 'Geiger' in German means 'violinist,' or 'violin maker,' right?" It does! I confronted my grandmother with this. Why didn't she ever tell me what her name meant? "It wasn't my name any more," she said with a feeble smile. I suppose her name meant many painful things to her. But for me, it meant that she gave me something. 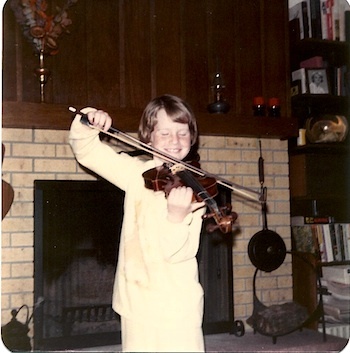 I started playing the violin 35 years ago today, but it's clear to me, it started long before that. February 18, 2012 at 07:16 PM · Great story, Laurie! I am also interested in family history. February 18, 2012 at 08:14 PM · Neat story! February 18, 2012 at 09:08 PM · Great story. A violinist from the Geiger line. Who would have thought!? :) years after I took up the violin I read my grandfather's life history. Grandpa emigrated from Sweden when he was in his teens. He mentioned his maternal grandfather who was a violinist. He may have been a folk fiddler but I don't know. My grandfather spent Christmas with us the year I got my first violin as a Christmas present. February 19, 2012 at 03:45 AM · What a neat story! Thanks for sharing. 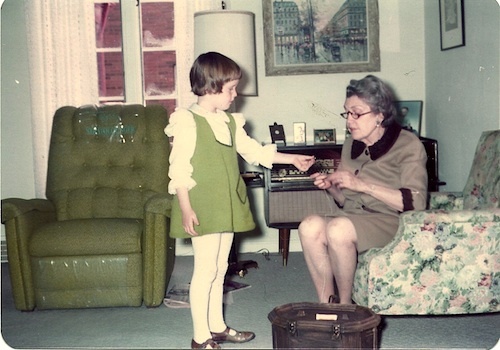 My great-grandfather played the violin, and it was passed down to me when I grew into a full-size. I still use it today - it's a really nice instrument. Who would have have thought it would be in the same family over 100 years later. I believe he was the original owner, then it got passed down to my aunt and then to me. I wish I knew more about him and his playing ability... maybe he was pretty good, but I can only imagine he played it for fun. February 19, 2012 at 04:11 AM · Wonderful story and wonderful photos! February 19, 2012 at 04:39 AM · I knew some Geiger's here in Cleveland. They lived on Lorain Avenue. They owned a sporting goods store. They gave my parents my first bicycle, a ten speed. I still have it. It is as old as I am. I wonder if they were related. You said though, your Grandmother was married by then. Still they may have been distant. Glad to see that the violin was so written in your destiny. It's great to know were the bloodline of music comes to you from. Excellent blog. February 19, 2012 at 11:35 AM · Laurie that is so awesome. I'm also from German bloodlines on my grandfathers line. His family name was Munch. They had a music school in Germany were one floor was music school and one floor was the familys space. The family sent the violin to my grandpa a long time ago. It was in the family hundreds of years. It belonged to my great great grandfather who was a great player. Grandpa wanted me to have this violin since I was 5 I never did get it. I still hope it will someday come home to me. I am the only one in the family who plays or even knows the history. February 19, 2012 at 01:42 PM · Adorable picture. February 19, 2012 at 07:56 PM · Great history, Laurie. Thank you for sharing. February 19, 2012 at 10:18 PM · Love the story Laurie. I too have German ancestry, albeit without violins, from eastern Germany and the story of theirs and my mothers histories are always enthralling for me to listen to. I understood straight away the Geiger name irony. Also Geige is the german name for violin or fiddle. So it was an apt name after all perhaps. February 20, 2012 at 06:13 AM · Beautiful story, Laurie! I'm so glad you've been able learn about some of your family's history. February 20, 2012 at 03:26 PM · What a neat story. Thank you for sharing it with us. February 20, 2012 at 07:53 PM · Thanks for all your responses, and it's fascinating that so many people find fiddle players in their history, when they look at generations past. Don, your Geiger friends could well be related to mine; they were all west-siders. And about the violin, it's so funny, when I was trading everything I could trade for my Italian, the off-Roth turned out to be worth more to the luthier than was the German family fiddle, which clearly had the better sound. So I kept the German but actually got a pretty good trade-in for the Roth. It just goes to show that the "worth" of a violin is not exactly pegged to its sound! February 20, 2012 at 08:38 PM · My uncle, William Allendoerfer, my father's younger brother, is really into ancestry and he's become the expert and the keeper of the knowledge about the Allendoerfer side of our family. The Allendoerfers came to the US in 1848 (from Germany), but as far as I know they came without a violin. There aren't any violinists, or even any musicians, that I know of on that side of the family. Until I learned German and the meaning of the word Geige, I had always associated "Geiger" with the Geiger counter, which clicks or beeps to measure radioactivity. (The Geiger counter was invented by Hans Geiger, a German nuclear physicist.) I find that sound a bit sinister, so I was pleased to associate the word with a better sound. February 21, 2012 at 06:15 PM · Does anyone our age NOT have a picture somewhere with that same green chair in it? Cool story about your family name. There's almost always something inspiring about an old family violin found in an attic. Love it. February 22, 2012 at 08:06 PM · Laurie - wonderful pics and story. My great-grandfather, surnamed Koenigsberg, who came from Prussia, arrived in the 1860s NY City with his family. He and two of his sons were professional violinists. One played in the Damrosch orchestra in NYC, where they first resided. Then, in the mid/late 1870s, they all went to Denver, CO. One of his sons was probably the first really serious classical musician in Denver, and a book on music in Colorado to 1889 reported his heroic efforts to interest the locals in classical music. He was the preeminent violinist in Colorado for some years but made his living as head of a small group that played wedding, etc., gigs. When my grandmother became bedridden with MS, he and another relative who was a professional pianist would come over and play for her. According to my aunt, when they did so, my grandfather would open the windows so the community could enjoy the music.